Through the continuous activity of ion pumps in the plasma membrane, relatively steep transmembrane electrochemical gradients are maintained. 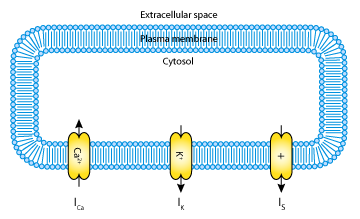 Because the transmembrane distributions of many ions such as Na+, K+ and Ca2+ are far from equilibrium, cells are inclined towards excitable electrical activity, or the membrane potential, determined by relative charge distribution, exhibits complicated patterns of slow and fast oscillations associated with variations in the transmembrane ionic currents. These dynamics play an essential role in intracellular function and intercellular communication. When exposed to a threshold concentration of glucose, pancreatic beta-cells exhibit a complicated pattern of electrical activity. Bursts of action potential spikes (the "active" phase) are observed, separated by a "silent" phase of membrane repolarisation. Insulin secretion is dependent on the relative amount of time the cells spend in the active state, and this time increases with the concentration of extracellular glucose. Bursting dynamics control the influx of Ca2+ into the cell, and in turn, Ca2+ triggers the release of insulin. So, via this mechanism, the bursting dynamics of the pancreatic beta-cells regulate their response to varying glucose concentrations. Below a threshold glucose concentration (about 5mM), the cells do not burst. Above a certain concentration (> 22 mM), the cells display continuous spiking, and insulin secretion becomes saturated. Mathematical models of pancreatic beta-cells are usually based on the Hodgkin-Huxley formalism (for the original model see The Hodgkin-Huxley Squid Axon Model, 1952), with elaborations to account for Ca2+ storage, glucose metabolism, and regulation by ATP and various hormones. Several models have been published (see the CellML repository for more pancreatic beta-cell and calcium oscillation models), but although some have been established for some years, their bifurcation structure is so complicated it is not yet fully understood. The goal of the 2001 Mosekilde et al. paper analysed here was to give an accurate, but simplified account of the bifurcation structure of the individual beta-cell (see the figure below). A schematic representation of the ionic currents described by the Mosekilde et al. 2001 pancreatic beta-cell model. The model includes a calcium current, I Ca2+ ; a potassium current, IK; and a slow current, IS. Derived from workspace Mosekilde, Lading, Yanchuk, Maistrenko, 2001 at changeset aa0e676c403f.